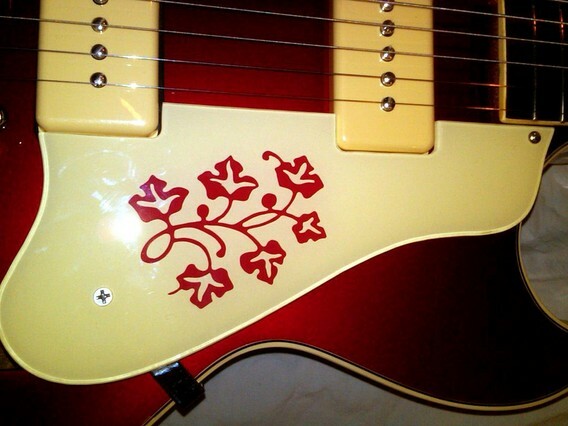 A while back I made up some Gibson ES-295 Pickguards in several color combinations. 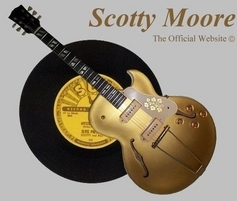 I recently received some great photos and information detailing the effort it took to restore these instruments made famous by Elvis Presley's guitarist, Scotty Moore. David Nicholas was kind enough to share his story & Photos. Enjoy. 21 years ago, things were different in the vintage guitar world. Without the interwebs, classified ads were my prime source. One week in the DC City Paper, an ad appeared for a red ES-295. 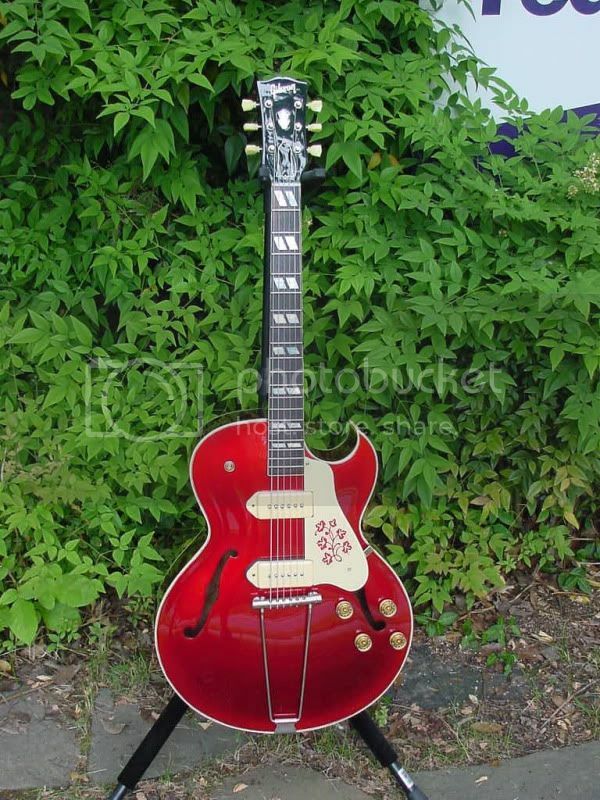 It had the wrong tailpiece and was likely a refinish, although Gibson records say 2 red models were actually produced (take that with salt, but so it is written). I had no means for it at the time, but of course was blowing a gasket for it. The flake selling it decided once he spoke to me that he really just wanted to trade it for a Martin HD-LE. I knew zero about limited edition Martins with hollow octagon inlays, but damn if I didnt make it my mission to scour the earth for one to arrange a possible trade. The flake decayed into true flakehood and never kept in touch despite my getting pretty close on locating Martins that were in the ballpark. I resigned it to a lost cause and carried a torch ever since. I've gotten lucky on 2 other ES-295s (a gold refin from Gruhn, and a black refin from the Gibson factory from Elderly) but remained haunted by the red whale. In 2009, a network of contacts flushed out one that was stripped natural - a diamond in the rough. Plenty of foolishment needed correcting here: the fretboard had been planed to correct a hump and some frets replaced. The pickguard was replaced with a black repro, Fralin p90s were in place (which I've kept and sound great), and the tailpiece (the bane of this model) had been molested on one of the end screw caps. Despite all this, I saw an opportunity to restore it, get it playing right, and refinish it to the red I've always wanted. The real shock was how unplayable the neck was with a fretboard sunken far below the nut. Reminded me of the Sunken Road civil war battlefield site near Fredericksburg. And we all know how badly that turned out. At the same time, a very similar item showed up at Mandolin Bros in Staten Island. 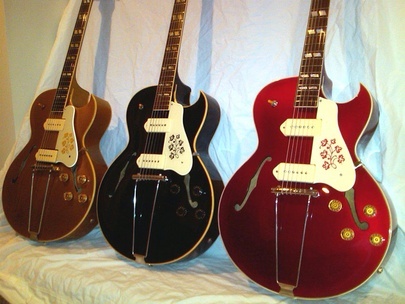 A limited edition ES-175 with p90s. What are the odds? I bought it as an insurance policy. If the stripped 295 was unsalvageable, I'd have the 175 and would only need to replace the tuneamatic with a trapeze (gee those are so easy to find - right?- NOT!) but I did it for my black one, so I took it on faith that when the restoration was done I would sell the 175 at a reasonable price. I did that a few weeks ago here on tgp - all good. After some research here on tpg, I found Stike at Rowyco Kustoms in Durham NC for the refinishing job. Ideas were exchanged. Plans were made. I had Greg remove all the major organs, painful, since it was dialed in so perfectly, and drove the husk down to Stike's shop. A pleasant drive if done offpeak midweek. More ideas were exchanged and a test mule had been prepared for evaluation on the right balance of candy red with a base coat of gold beneath. Warning: if you visit the Rowyco shop, you WILL walk away inspired for more projects than what you just dropped off. The caliber of Stike's work is simply peerless and invites creative thinking. We are recording in July and these will feature prominently. My thanks again to the surgical team of Greg at Metro Guitar Service and Stike at Rowyco Kustoms and Mike at C-Rocker Guitars. Absolutely top notch service every step of the way in realizing a dream of over 20 years!